Have you experienced a tiny home where tile is the star? 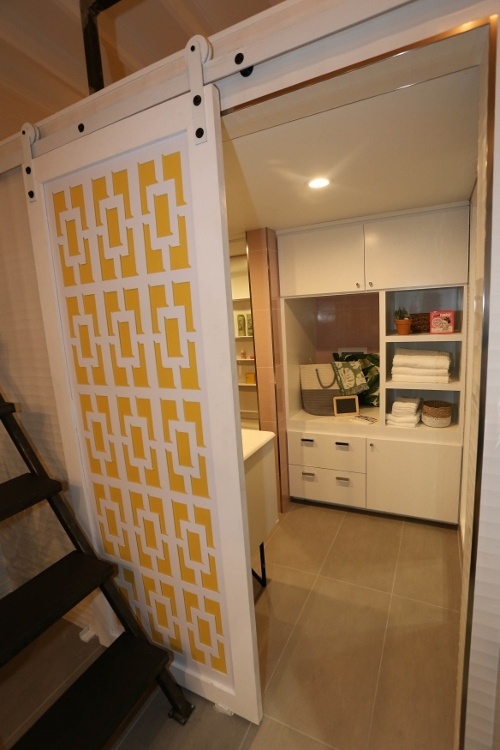 Coverings 2017 featured the live installation of tile in three such tiny houses on the Coverings show floor, including the Palm Springs Mid Century Retro Tiny Home featured in this article. Kim Lewis Designs collaborated Visalia Ceramic Tile, Inc. to bring this project to life. We caught up with Kim Lewis to learn more about her, the project and how she used tile in the design of her tiny home. CTEF: Kim, tell us about yourself and Kim Lewis Designs. KL: I am a free-spirit with an adventurous soul. While growing up, creativity was my expression. At an early age I lost my mother, so art became my tool for healing. I am 36 years old and have never owned a home because I’ve chosen to travel. I want to explore the world, see places and meet people! My first design job was for the television show ABC’s “Extreme Makeover: Home Edition”. The Producers found me in Austin, TX, while I was working at a furniture importer. Next thing I knew, I found myself in Los Angeles for the next 7 years leading the design team for the largest home makeover show in history. This is where I began Kim Lewis Designs. CTEF: What about Kim Lewis Designs and designing tiny homes? KL: Character driven design... Homes with a personality... That’s my wheelhouse. I believe our homes should speak to who we are. Our homes should tell our story. My favorite thing about designing tiny homes is that approach. Each of our models has a unique approach to the colors, finishes and textures. Our tiny homes are inspired by places I’ve traveled to around the world: Bali, Palm Springs, Joshua Tree, Marfa, and more. Tiny homes are all about indoor/outdoor living. Personally, I love spending time outside, so I appreciate incorporating a connection to nature into these homes. Dreaming about things like vintage claw foot tubs outside makes me excited! I truly KNOW these tiny homes can and will increase the quality of life for homeowners. We have the chance to change lives through design and break the mold of traditional home buying by designing an affordable, yet unique housing experience. CTEF: How did you get started designing tiny homes? Honestly, I connected with these homeowners who wanted to downsize and live a more adventure-filled life outside of their home. Drawing tiny homes, I realized for the first time I was my own customer. I WANTED to live in one of these too! One of my designs for the show gained a lot of exposure, and people started asking how they could buy that house (The “Mid Century Marfa”), so I decided to do something about it! I want to provide people with a way to own a home that is uniquely beautiful, while enabling them to afford life outside of the home too. Our home should be part of the adventure, not hold us back. CTEF: How did you get involved in the Installation Design Showcase? KL: The Coverings staff heard about my new line of tiny homes, so they asked me to participate in this very cool exhibit for the show! 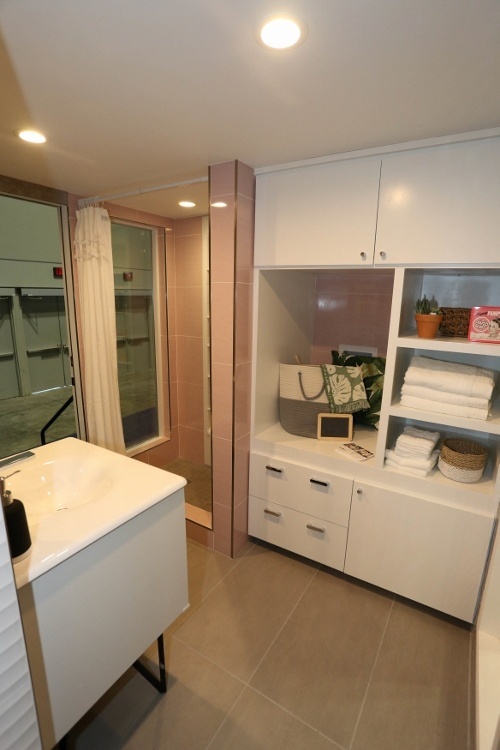 KL: In a tiny home, you are up close and personal with every part of the space. As a result, function, beauty, and comfort must all be in balance. As a rule, every piece of furniture must function in several ways. Designing smaller spaces is extremely challenging, and thoughtful design is so important. Intentional is the key word to a successful tiny home design. We installed tile creatively throughout the space to showcase the versatility of using a waterproof material to utilize every square inch of a tiny space in different capacities. In a tiny home, surfaces have to be beautiful, but durable. The graphic patterns and textures of the tiles play into our Palm Spring Bungalow vibe. 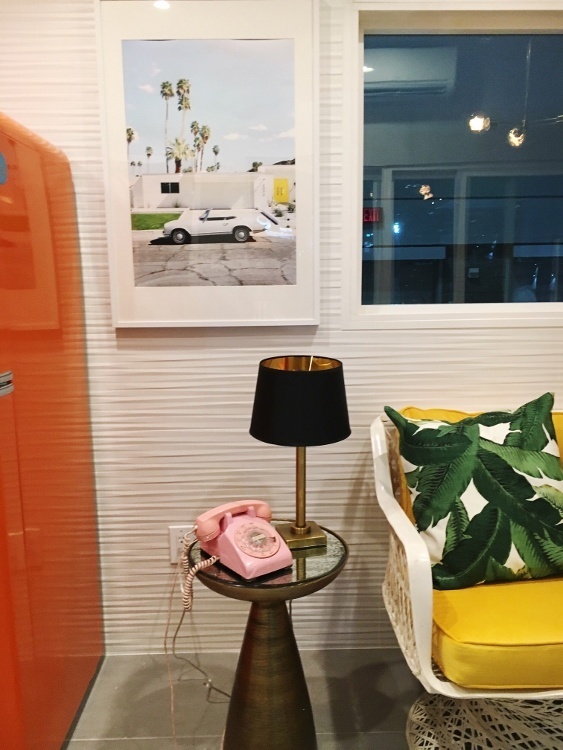 CTEF: What inspired your “Palm Springs” theme? KL: I was inspired by the seamless indoor and outdoor living in Palm Springs, and the concentration of gorgeous mid-century homes there. I love the eclectic mix of styles in the desert oasis, and I thought it would be a great canvas to showcase how to live big in a small home with bold, colorful style. I believe that outdoor living is essential to the tiny living culture (and healthy for everyone! ), so what better inspiration than to create a home meant for the open range of a desert. CTEF: Which tile products did you select and why? 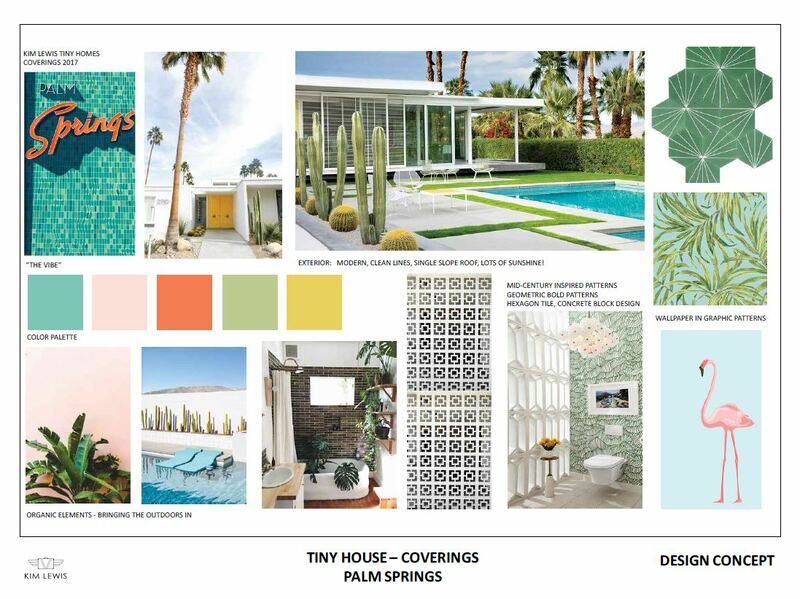 KL: We took an artist’s approach to selecting tile in our Palm Springs Bungalow. The matte white living Room walls are the 3D Wall collection by Atlas Concorde. The texture of this pattern was a perfect nod to the Mid Century era. The shower walls were also by Atlas Concorde from the Magnifique Collection in the color “Rosa”. 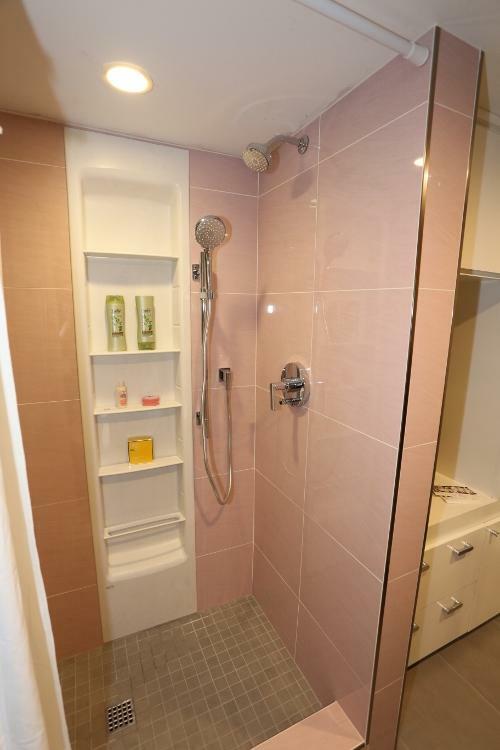 Nothing says mid-century like a pink tile bathroom! (Reminds me of my grandmother’s house!) This was our modern take on the classic 50s pink trend. The mosaic gray bathroom tile from Richetti Group in Italy is the perfect complement. In the kitchen we have the Turquoise Dwell Mosaic by Atlas Concorde. This aqua blue is my favorite color (I even drive a 1977 truck FordF150 this color!). 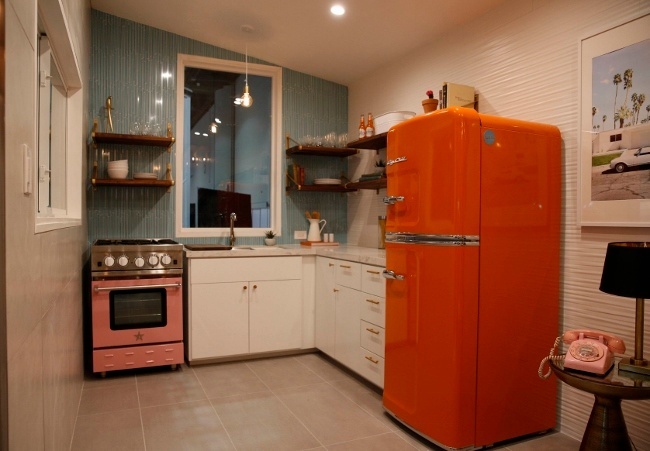 I am all about bold color combinations, and I knew it would look stunning with the pink and orange appliances I had in mind for the space. KL: The Coverings show provided us with the ultimate tile challenge… to build a tiny home AND cover every surface of this tiny home in tile! That meant walls, floors, counters…everything. I wanted to maintain the look and feel of a traditional living space, without being obvious about the fact that every surface was tiled. I love being challenged by unconventional design! I think one of my favorite features of the project was born out of this challenge. The living room 3D tile gave the space so much texture and a big nod toward the mid-century. KL: Sure, there always are! One of our tile orders arrived in the correct color, but in the wrong shape. We did not have enough time to return for the original shape we wanted, so we just moved forward with the tile that was delivered. It turned out great! Part of design is learning to ‘go with it’ sometimes. Installers will appreciate you for it! CTEF: What was it like working with a tile installation team like Visalia Ceramic Tile? KL: They were such a pleasure to work with! They are experts when it comes to the tile installation, which is often an overlooked component of successful design. They knew exactly how to install each variety of tile and had great suggestions for the most efficient installation. Minimizing the waste during an install can save so much money! We worked really collaboratively with them to complete this project, and had so much fun in the process! 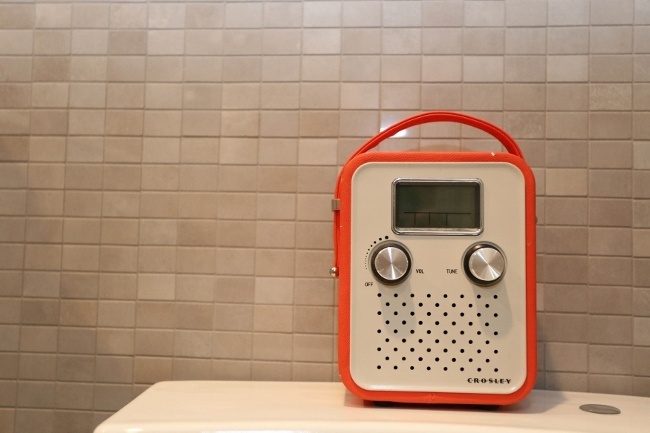 CTEF: What kinds of challenges do you regularly encounter when it comes to designing spaces that include tile? KL: Finding the right scale for small spaces can be a challenge, especially when you are using tile creatively on surfaces that might not usually have tile! It is very much like mixing patterns- there is an art to it. I like to mix up the size of tiles so that the space doesn’t look too uniform or gridlocked. KL: I could not be happier with how our tiny home turned out! We ended up naming the tiny home “Vivian” during the process, because any good design deserves a name! We also really enjoyed meeting the other designers, the vendors, and installers. What a fun show to be a part of! Thank you, Coverings team! We have to say thank you to our incredible Sponsors: Nook Tiny Homes, Kohler, Rustica Hardware, Blue Star, Big Chill, Parasoleil, Barn Light Electric, Ceramics of Italy, Atlas Concorde, Richetti Group, Mapei, and USG. CTEF: Kim, how can readers learn more about you? KL: You'll find us in written and online publications such as People, InStyle, House Beautiful, Washington Post, Austin Woman, TyPennington.com, BScene Magazine, Forbes.com, The Design Network, and others. 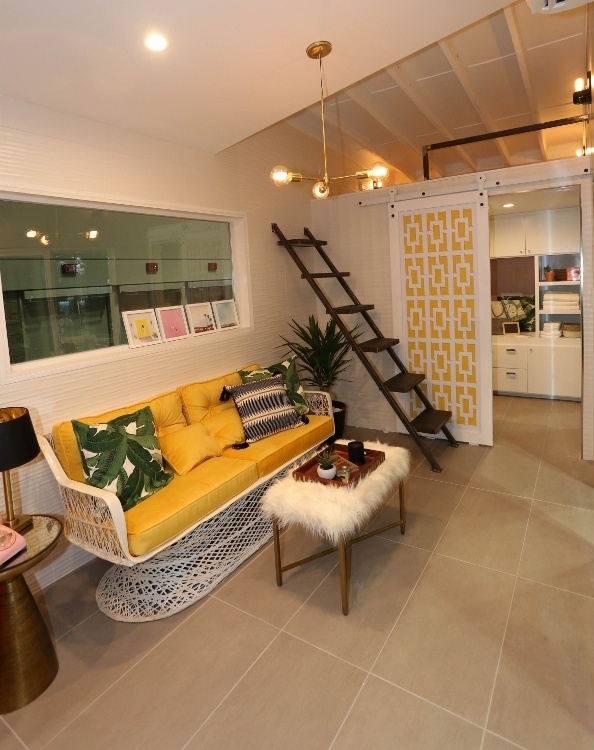 Did you get to see the Palm Springs Mid-Century Retro Bungalow Tiny House at Coverings17? What did you think of it and how the tile accentuated the design? Let us know in the comments.